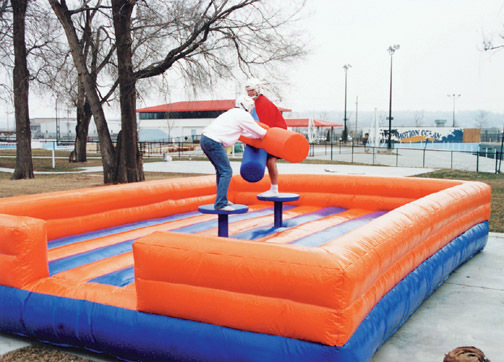 Our inflatable jousting allows contenders to go at it gladiator style! Warriors try and keep their balance on the pedestal whilst trying to smash their opponent’s hopes and dreams! Who will hold on and who will fail in the ultimate renaissance battle? An excellent way to spend a day and relieve a little tension! Be sure to check out our COTTON CANDY and SNOW CONES. They are always a welcome treat. You may also be interested in our VELCRO WALL or SUMO SUITS. Even though we specialize in fun, we take safety seriously. Fun Services staff is insured and licensed. So you can expect to receive quality, professional service with every rental from Fun Services of Nebraska and Iowa.